Dawn’s first dog, Sunny, showed up on her doorstep during a hurricane evacuation. After failing to find his owner, Dawn adopted Sunny. He was a wonderful hound dog that traveled all over the country with Dawn and her husband. Prior to Sunny coming into Dawn’s life, she always considered herself a cat person, but now says it’s a toss-up! Like many of the other pet sitters on the team, Dawn has been rescuing animals her entire life. Her most fond memory was sneaking a neglected goat into her bedroom at age 12. Her parents will never forget that one! 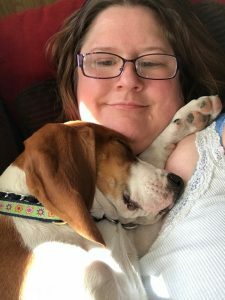 Dawn currently shares her home with 4 rescued cats and a very energetic Walker hound puppy, Daisy. Dawn has lots of experience with working at vet clinics in the past, as well as volunteering for pet rescues. Animals are just part of who Dawn is. When she’s not busy with her own pets or working for The Pet Sitter of Boise, Dawn enjoys hiking and camping with her husband and dog. Another interesting tidbit about Dawn is that she has lived in 49 of the 50 US states! She plans to stay in Boise long term now, however. Dawn calls herself an equal-opportunity animal lover…she loves all animals and plans to always work with them. Dawn covers SW Boise and surrounding areas for The Pet Sitter of Boise.